With a stay at Deco City Motor Lodge in Napier, you'll be within a 10-minute drive of Napier Beach and National Aquarium of New Zealand. Featured amenities include dry cleaning/laundry services, luggage storage, and laundry facilities. Event facilities at this motel consist of conference space and a meeting room. Free self parking is available onsite. 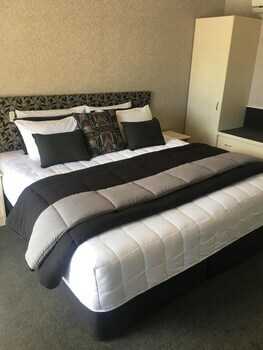 Located in Queenstown, The B and B on the Hill is within a 15-minute walk of St Josephs Parish and Church of St Peters. Free self parking is available onsite. With a stay at Rock Solid Backpackers Rotorua in Rotorua, you'll be within a 10-minute walk of Eat Street and Rotorua Night Market. Featured amenities include luggage storage and laundry facilities. With a stay at Lakeview Heights B&B Farmstay in Hamurana, you'll be within a 15-minute drive of Lake Rotoiti and Okere Falls Scenic Reserve. Free self parking is available onsite.